If I had to describe Vanuatu in one word, simply, PARADISE. With a tropical pace, it is the perfect place to slow down, immerse yourself and be in the moment . Just a few hours from Australia and New Zealand, Vanuatu Islands are the perfect place to take time out from the busyness of life and recalibrate. It’s scattered 80 plus archipelago islands are far beyond any notions of flashy resorts and cruise-ship ports. World-class diving, deserted beaches, waterfalls, remote and rugged islands, ancient cultures are just a small part of the appeal. The resorts and restaurants have little in common with traditional custom village life in the outer islands, but it’s contrasts like these that make Vanuatu a surprise. Where else can you hike to an active volcano to stare down into crater then swing from a tree into a blue hole and drink kava with the local village chief – all in the same day? Resilient and laid-back as ever you will be in awe of the local Ni-Vanuatu people. Vanuatu was devastated by Cyclone Pam in 2015 but the locals take times like this in a smiling stride. 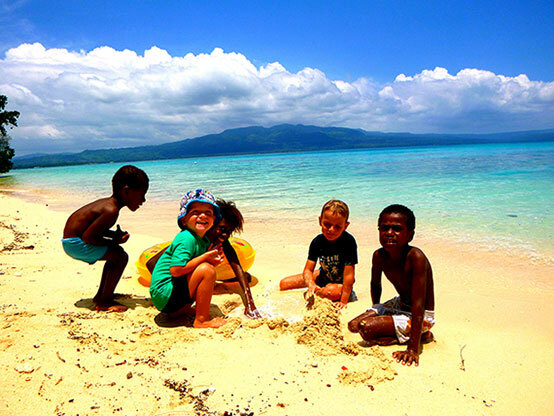 See why Vanuatu has been named the happiest place on earth on numerous occasions. The Vanuatu Island’s are an adventure within easy reach. They have been right in front of you all along, waiting to be discovered. Come explore today, you won’t be disappointed! Coming soon… Our Top 10 places to….